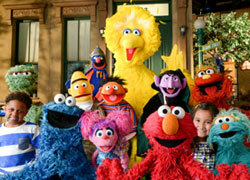 Sesame Street Characters on Simpsons-Were you Offended? I didn't make my avatar. I found it on the internet somewhere and it was already moving. THESE ARE AWESOME!!!! :D Tell me if you do one with Sam Eagle. What page are you guys on? I've been reading it and it's really hard to put it down! It's really good! :D I'm on pg. 250. Do the Muppets ever annoy you? Have a blast! :) Hope it's fun! 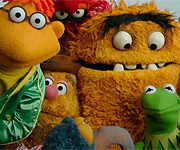 I was wondering what Character done by Brian Henson was your favorite? I really liked him as Hoggle in Labyrinth. I mostly picked Sam Arrow because he's my favorite character. I also like him as Samuel Arrow and I like the things it came with. Happy Birthday Zack The Dog!!! WOW! Those are great! I know people who dream of making puppets like that. :smirk: ;) Namely Mr.Penguin.